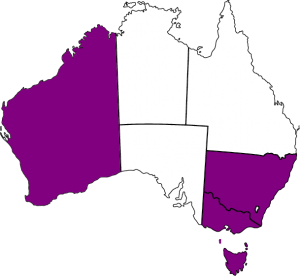 Whilst we intend to expand the National Gynae-Oncology Registry Australia-wide, it is currently operating in only Victoria, New South Wales, Tasmania and Western Australia (application in progress). We also aim to achieve whole population capture (i.e. to recruit, or at least invite 100% of eligible patients to the registry). Currently we do not have whole population capture in these four states, but we will expand to other hospitals and health services over time. The NGOR would like to thank Ovarian Cancer Australia, the CASS Foundation and the Australian Society of Gynaecologic Oncologists Inc. for their generous support.